The very popular and in Big Demand Country star, Nathan Carter, was performing in the Four Seasons Hotel, Monaghan, recently and prior to going on stage he had time to meet with Shauna McPhillips and her family. Shauna suffers from Rett Syndrome and it was terrific that Nathan gave time to find out about the condition and the problems faced by Shauna and her family on a daily 24 hour basis. He presented Shauna with a signed T-Shirt as our photo shows. Thanks to Nathan and his manager for giving the time to Shauna and her family prior to his performance in the hotel that night. It is comforting for the family to meet people who will take an interest in the Rett condition and hopefully the authorities will come to understand the condition and the needs of the sufferer and the family. There are fewer than 100 Rett Syndrome people in Ireland though there may be more who have not been diagnosed or have been misdiagnosed with a different condition. It is caused by the mutation of a gene and mainly effects females. Generally males who have the condition seldom survive birth. Girls develop normally for the first 15 to 24 months and are usually stepping about, chatting, and fending for themselves as we understand normal behaviour for that age group. Then the mutation occurs and within weeks, and sometime days, all methods of communication stops and the child loses mobility and other abilities. Further complications develop - difficulty in breathing, swallowing, and in some cases seizures can become common, but the complications can vary from child to child. This rare condition is generally not something that doctors meet and so little is known about treatment. At international level great strides are taking place and in depth research is on-going. A drug has been developed in America which has had a very positive outcome when trials were conducted on mice and efforts are in train to get permission to hold human trials. 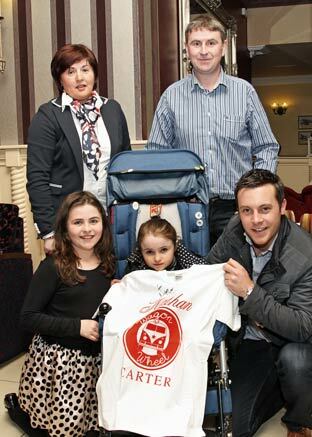 Nathan Carter presents a signed T-Shirt to Shauna. Also in the picture are: parents, Marie and Declan, and sister, Sinead.